2012-2013 have been mostly about Portugal trips and our wedding. The great thing above and beyond the wedding is that it is often if not always followed sometime and somehow by a trip, the honeymoon. For ours we are lucky and fortunate enough to get to go to Fiji thanks to a most generous wedding gift. Last weekend we got the last bits of kit we realised were missing during a packing dry-run. In a few days we’re off. While we’ll explore this paradise in the Pacific, house-sitter and cat hotel will look after home and feline. That’s right, we went piranha fishing. Rather than write out what actually happened in detail, I’m going to be lazy, give a summary here and let you watch the video below. Went to a small lake into a paddle boat. Tied boat to a tree near a shallow quiet area. Baited our lines (with chicken skin, piranhas will eat just about anything from what our guide told us). Caught 4 yellow bellied piranhas! Georg gutted and cleaned the fish (it’s a long part of the video, for those not interested just skip ahead). Ate our fried piranha fish, gotta say not the worst tasting, pretty yummy even! Collect bragging rights because, well … how many people get to fish for and eat piranhas? The video is nearly ten minutes long, so feel free to skip to the good bits. Enjoy the video. So day two of our journey in the Amazon, we rose (I say rose and not woke up, because believe me, I was sleep walking) at 5AM. We got dressed and headed to our boat with the bird clay lick as our destination. “On a good day you can see up to 20+ species of birds at the clay lick,” so said our confident guide. 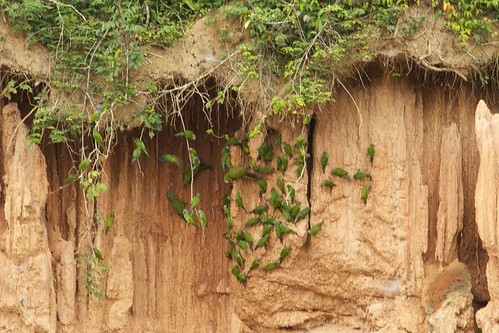 So we arrived — and to our delight– several species of parakeets and even a few macaws were in the trees and on the clay lick. They were eating the clay and making lots of noise enjoying themselves in the process. Thankfully they were not cognisant to our presence, the eco-lodge has a floating catamaran in the middle of the river covered in dry leaves that works wonders as camouflage. So we sat and snapped photos gallor for about 15 minutes. We were really hoping that some yellow-bellied or red macaws might show up over the next few hours, unfortunately it began to pour. The birds were having none of it and flew off in a hurry and flurry. The rain eventually stopped, but the birds did not return. After waiting for a few hours, we gave up and headed back to the lodge. So, after one day in Cusco, we were off again. We are flying from Cusco to Puerto Maldonado to reach the Amazon Basin. The first destination, a tiny little jungle lodge on the Heath river just inside Bolivia where we spent three days. After a short one hour flight from Cusco we arrived on the airstrip at Puerto Maldonado’s International Airport. This place was tiny, open, had no air conditioning, and just one runway, it felt really rural. The heat was the first thing we noticed, in Cusco it was a comfortable 20 degrees (68 Fahrenheit), Puerto Maldonado was more like 35 degrees (95 F), add 80% to 90% humidity and you’ve got some mighty powerful heat. Our tour guides picked us up from the terminal and we headed over to their base. From there we met our guide for the next 6 days, lovely fellow by the name of Caesar, and headed to the boat to take us to the jungle lodge. WARNING: When entering the jungle you will be on a boat for hours at a time. My advice use the loo before you leave! So anyways we were on this little boat for about 4 hours on the Madre de Dios river eventually we got to Bolivia. We had lunch on the way in the boat, a kind of Peruvian stirfry in a big jungle leaf. Shortly after crossing the border we headed into a smaller river (Heath River), where we saw lots of birds and turtles hanging about. In about an hour we arrived to ice cold welcome lemonades and an empty lodge to ourselves! 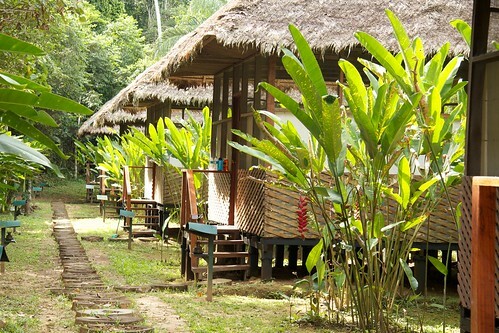 Below is a photo of the bungalows, amAzing right? So we settled in, got acquainted with the lodge and spent our afternoon on a short hike through the jungle seeing mostly flora, fauna, insects and a few tiny frogs. 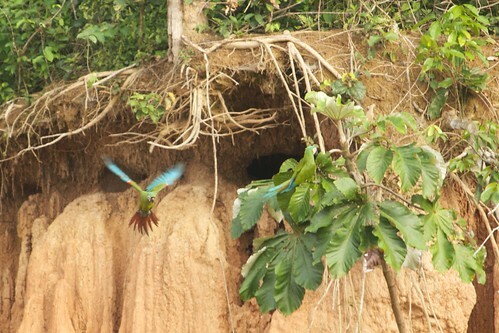 We went to bed early because the following day we would get up at 5AM to go looking for parakeets and macaws at a local clay-lick. Finding a place to change money in Peru was a breeze — IF you are exchanging dollars. I should note Euros are becoming more common. There are exchange stations everywhere, however the rates are dreadful. You can go to the banks but you will queue for ages. The best way to get cash (Peruvian Nuevo Sol) is from an ATM or in advance from your bank or some other company such as American Express or Thomas Cooke. For those of you from the UK, I should note that pounds are not as widely exchanged in the little shops and street vendors. US dollars however are everywhere. In fact you can usually buy things using dollars. Services, hotels, tours, etc are often priced in dollars. Keep in mind that you will receive change in sols. The problem comes in with the dollars themselves. If you do plan to pay with them or want to exchange them for sols they’d better be in MINT condition. If the bills are well worn, have even the tiniest of nicks or tears, or just aren’t crisp enough people will not accept or exchange them. Honestly, you’re just better off using nuevo sols. I saw no advantage at all in having gotten dollars before the trip, in fact since some of the dollars we had weren’t perfect, it became a problem. Our advice, bring very little if any foreign currency with you. Just get sols from a bank or ATM on arrival. Compared to London, Cusco is death-defyingly high! The highest point in London according to the internet is a mere 245 meters (804 ft). Cusco … 3400 meters (11,155 ft). Georg slowly felt this unhappy surprise when we stepped off the plane into the tiny Peruvian airport. I imagine most anyone will feel the oxygen depravation unless you are from an equally high place. Altitude sickness is no joke though. Altitude sickness or Acute Mountain Sickness can kill. We advise that if you are hiking to Machu Picchu that you spend at least 3 full days in Cusco or equally high city before hand to acclimatise a bit. On our first day in Cusco both Georg and I felt a bit sick, headache was the big thing, and just struggling to walk up a simple hill were pretty clear signs that we were not in Kansas anymore. Cusco is filled with altitude sickness pills, there are adverts on every street corner. To that note you SHOULD NOT take them when you feel sick (pharmacists don’t bother to mention this for some reason). They will only make you feel sicker. The pills increase your red blood cell count so that your system can absorb more of the oxygen in the thin air. However if you take these when you already feel sick and your body goes into overdrive making more red blood cells you are likely to feel sicker. Different people have different tolerances. My advice, use common sense and don’t over do it, if you feel sick, just take it easy, sit and breath. For those of you planning to do the Machu Picchu trail 3 night / 4 day hike, make sure someone carries oxygen. We think the guides are actually required to carry oxygen, our guide did.